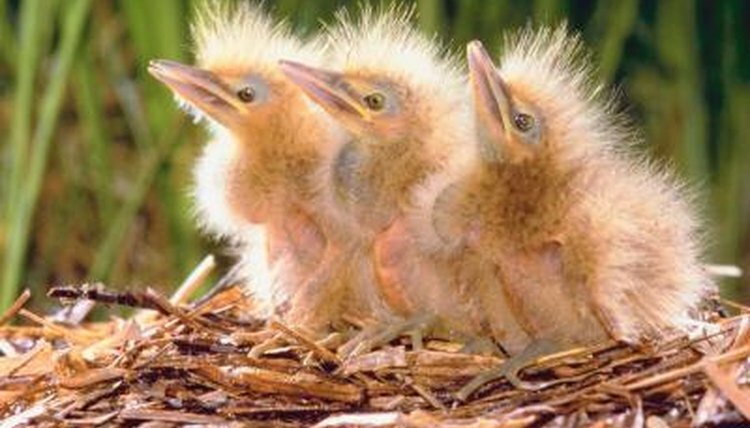 How Many Days Until a Baby Bird Can Open Its Eyes? The development rate of baby birds varies according to the species and environment in which the bird lives. For example, precocial birds such as quail and ducks, have a relatively high level of independence from birth. These are typically ground-dwelling and do not have the protection of a nest. These birds are born with open eyes and full vision. Altrical birds are born in nests, typically with closed eyes, and take longer to develop. Most nest-dwelling birds hatch with their eyes closed. They are relatively immobile after hatching and require their mother to assist them with most tasks, such as feeding. They are naked, save for only a thin layer of down, so require a nest and the presence of their fellow chicks for warmth. Precocial chicks typically open their eyes within a few hours of hatching. Since they are ground-dwellers, they are at high risk of predation at this early stage in their life. By day six of the bird’s life, his eyes will typically be fully open and his vision will be completely developed. This is a milestone in the life of a baby bird, as vision opens up a whole new world of possibility. With vision, he can now explore his surroundings, setting the foundation for further development. Once the eyes are open, the chick’s instincts will begin to take effect. He will display flinching and cowering reactions to visual stimuli and will begin to experiment with the use of his wings, primarily for balance as he walks around. Once fully feathered after week two, the chick will begin to instinctively preen himself, using his beak. How Do I Hand-Feed an African Grey? When Do Flamingos Stop Caring for Their Young?